"Cookies" are small text files Internet Explorer stores in a safe area of your computer; websites are allowed to store cookies to keep track of your user name, the content of your shopping cart if you are not logged in, the preferences you configured for a website portal, etc. At times, you may need to reset your cookies for one reason or another (it is often offered as a poor "cookie-cutter" troubleshooting solution by Internet Service Providers or software vendors). In this tutorial, we will show you how to delete your cookies in Internet Explorer. To delete your Internet Explorer browsing history in general, please see our tutorial on deleting your browsing history in Internet Explorer. This tutorial will also explain how to clear the cookies for a single website, which is in many case what you would like to do (and not erase your entire cookies). Continue reading to delete all cookies, or skip to deleting cookies for the current website only. We will also explain how you can disable cookies in Internet Explorer. The easiest way to delete your cookies in Internet Explorer is to go to the Safety menu, and choose Delete browsing history - you will see, we will not have to delete your entire browsing history just to delete your cookies. You can also access this functionality to remove cookies with the following keyboard shortcut, shown on the menu: Ctrl+Shift+Del. 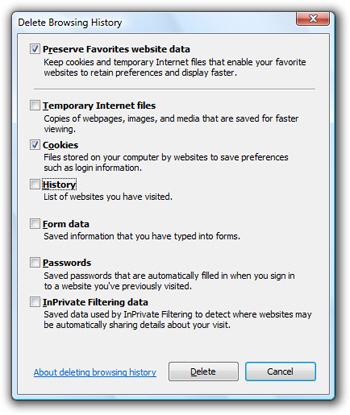 Internet Explorer will launch the Delete Browsing History dialog, which contains a number of checkboxes. We have checked and unchecked checkboxes as needed on the screenshot: this is how your selection should look if you want to delete all your Internet Explorer cookies. You should basically have only two checkboxes checked: "Preserve Favorites website data", and "Cookies". Everything else should be unchecked. Internet Explorer 8 ships with "Developer Tools", that are designed to help web developers program web applications inside Internet Explorer. The developer tools also include a cookie management tool, which allows to clear cookies for the current website: so, navigate to the website whose cookies you want to delete (or web page, as the case may be - some web pages are hosted on a different domain than other pages on the same website; since cookies are set for the current domain, it is preferable to navigate to the actual page from which you want to clear cookies). Once you are on the website whose cookies you want to delete, press the F12 key on your keyboard: Internet Explorer will launch the Developer Tools window. 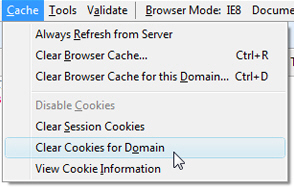 Click on the Cache menu, and choose Clear cookies for Domain. As soon as you do, Internet Explorer Developer Tools will show a dialog asking you final confirmation that you do want to delete cookies for the current website: " Are you sure you want to clear the cookies for this domain? " All cookies for the current domain have been deleted! This approach allowed you to clear the cookies you wanted gone, while retaining all other cookies which conveniently remember your website preferences, login information, etc. 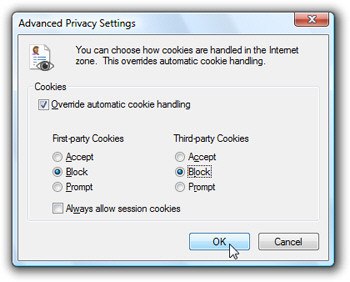 We have selected in the screenshot the settings you will want in order to block all cookies. Use these to override "automatic cookie handling" in Internet Explorer, and click OK. Internet Explorer on that computer (for the Windows user you are logged in as) will no longer support cookies (until and if you decide to re-enable cookie support — see below).